Watch-style activity trackers... what do you think of them? Certainly having your tracker on your wrist is convenient, as it can also serve as a time piece and also to display notifications from your phone. If you saw our review of the Garmin Forerunner 35 you would've read about a tracker that could do all of that and more. But it was, well... hardly stylish, eh? 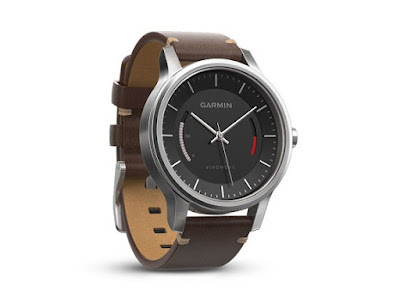 If you're looking to track your movement to sync to a smartphone app, while also looking fine and dandy to boot, check out the Garmin Vivomove. We did. Despite the name, the Garmin Vivomove is actually a pretty swanky looking watch and stands out from all of Garmin's watch-like activity trackers. At first glance it is just that; a watch with a large round face, analogue ticking hands, and a leather strap. However, take a closer look and you'll see there are two unusual indicators on that face. The Garmin Vivomove is essentially a stripped down tracker inside of a stylish watch. It will monitor only your steps and general movement, displaying the percentage of your daily goal on the left-hand dial. On the right-hand side there is a movement bar, which will ominously get redder and redder as a warning that you need to start moving around. It can also track your sleep, which is basically an extension of the movement tracking. All this data is then synchronised to your phone over Bluetooth to the Garmin Connect app, the same one we looked at in the Forerunner 35 review. With the Vivomove a lot less info is being transmitted, so the app is even easier to interpret. So... if you're crazy into your fitness and looking to monitor every step of your progress, this isn't the tracker for you. The step count seems very accurate (once the data is displayed on the phone, that is), but only being able to roughly see that you're 20% toward your daily step goal won't be enough for work-out fans. Still, if you're only after a brief overview of your movement, to highlight periods of stillness and aim to get yourself walking around more, this is good. Certainly as a stand-alone watch it looks fantastic, would be appropriate for formal situations, and doesn't have that 'look at me with my smartwatch thing' appearance. Which is a thing, we assume. 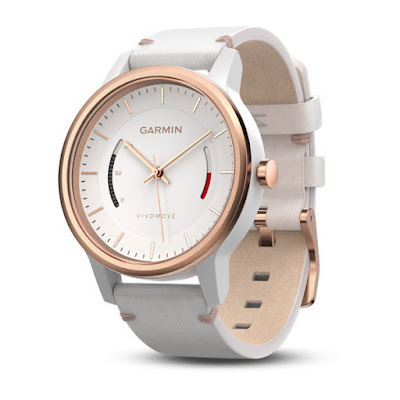 So Garmin's most bare-bones activity tracker is actually probably their prettiest. Is it for you?